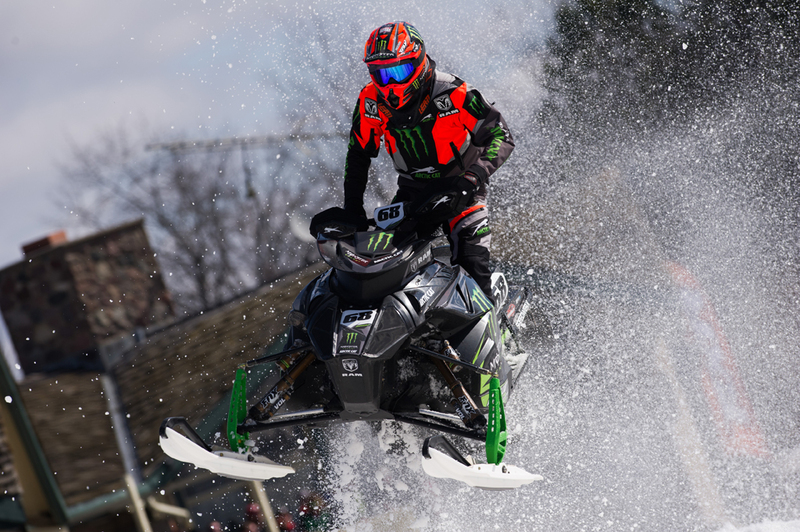 March 21, 2017 – Monster Energy / Arctic Cat / Ram Truck’s Tucker Hibbert finished third in the 2016/2017 ISOC National Snocross Pro Open Championship with a solid weekend of racing at the Ram Truck Grand Finale National in Lake Geneva, Wisc. The three-day event capped off another remarkable season for the 10-time champion. 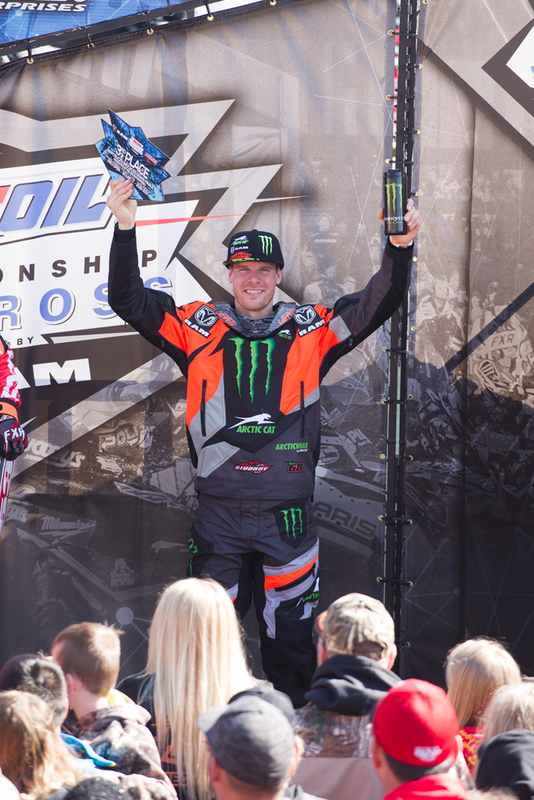 Hibbert’s victory in front of a packed crowd Saturday night was the highlight of his weekend. With a second place start in the 14-rider, 10-lap final, he was in good position but, ultimately, strategy played a major factor in the race. On lap six, the leader took the joker lane (an extended section of the track each rider was required to take once during the race), opening the door for Hibbert to take control of the race. He took full advantage of the opportunity, laying down fast lap after fast lap to pull a comfortable lead over second place. He waited until the final lap to take the joker lane and secured the victory. Recapping Hibbert’s 17th Pro National season, he tallied a series-high seven Pro Open final wins, 11 podiums and 14 top-five finishes. In the process, he added another career milestone to his record by winning his 125th Pro National race at the Eastern National in New York. 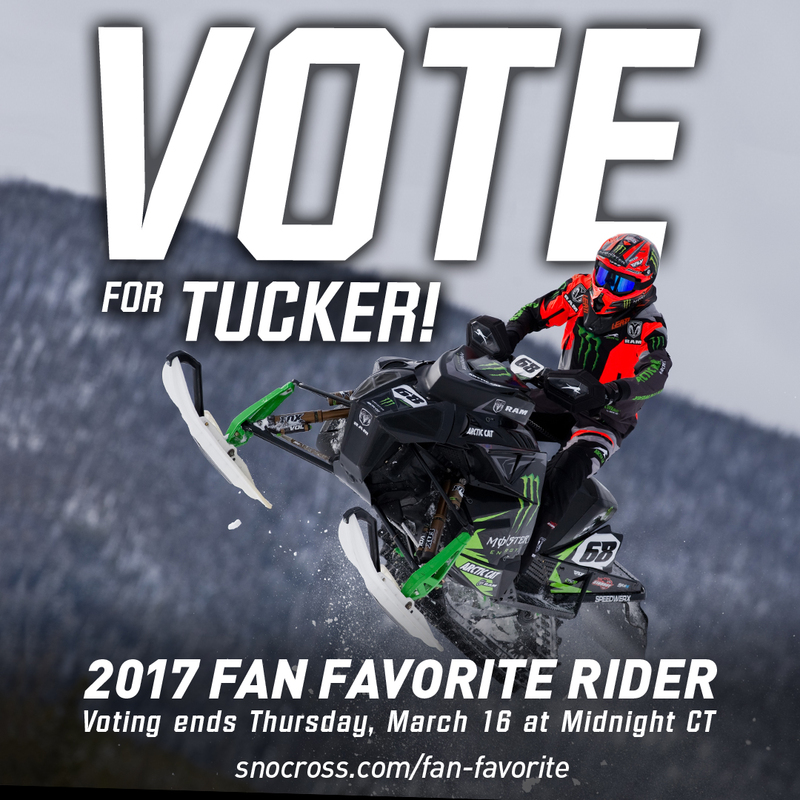 Vote for Tucker – Fan Favorite Rider! 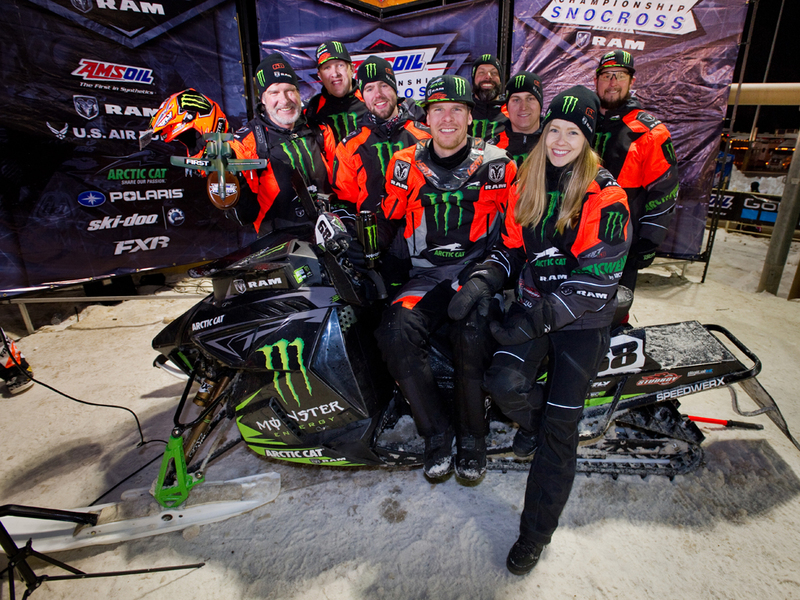 Tucker Hibbert needs your help to win the ISOC Snocross Fan Favorite Rider award. He took home this honor in both 2014 and 2015. If Tucker is your favorite, you can vote daily, on any web device (computer, phone, tablet, etc.) 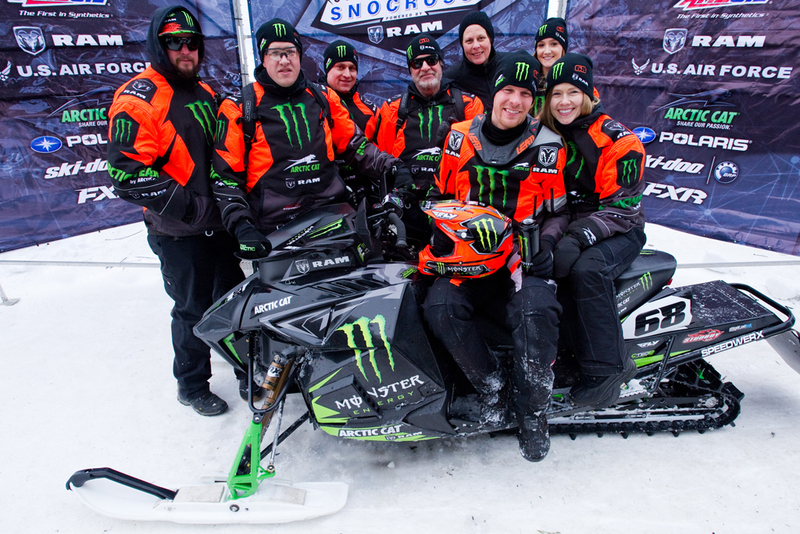 until March 16 at midnight CT.
March 7, 2017 – Monster Energy / Arctic Cat / Ram Truck’s Tucker Hibbert scored a podium finish at the penultimate event of the 2016/2017 ISOC National Snocross tour in Dubuque, Iowa. 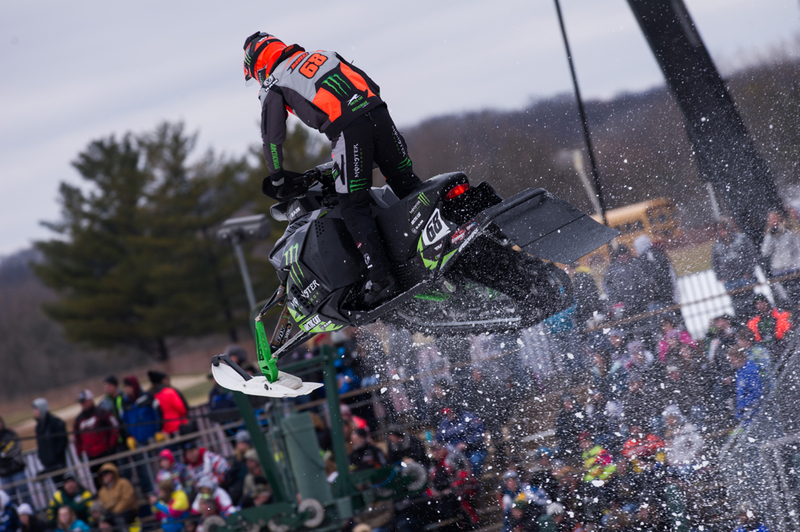 Marking the first time the national tour has landed in The Hawkeye State, the Iowa Snocross National featured a steep, rough track on a tight section of Sundown Mountain Resort’s ski hill. Friday night, Hibbert went 3-2 in qualifying and finished fifth in the final. The defending champion turned things up Saturday night finishing 1-3 in his qualifying rounds and putting on an impressive charge in the final. With a 10th place start in Saturday’s 18-lap, 13-rider final, Hibbert had his work cut out for him. Dodging carnage early in the race, he rode smart while pushing forward. He moved into fourth place on lap four but already trailed the leader, #53 Kody Kamm, by nine seconds. 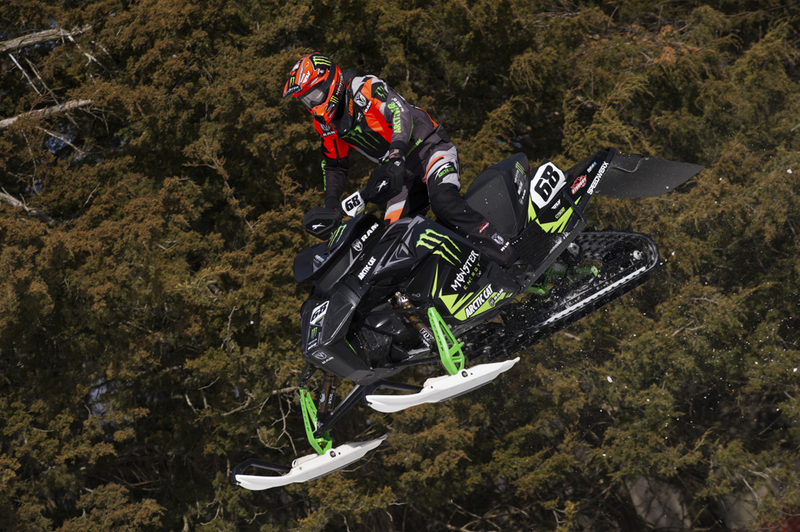 Hibbert started making big gains halfway through the race by turning laps one to two seconds faster than Kamm. On the final lap, he closed the gap and was within striking distance of the lead but came up short to finish second. Next up for Hibbert is the final event of the season in Lake Geneva, Wisc. March 17-19. He currently sits third in the 2016/2017 Pro Open championship and 44 points out of first place. With three days of racing and 177 points on the line, he’s still in the hunt to claim his 11th pro national title. 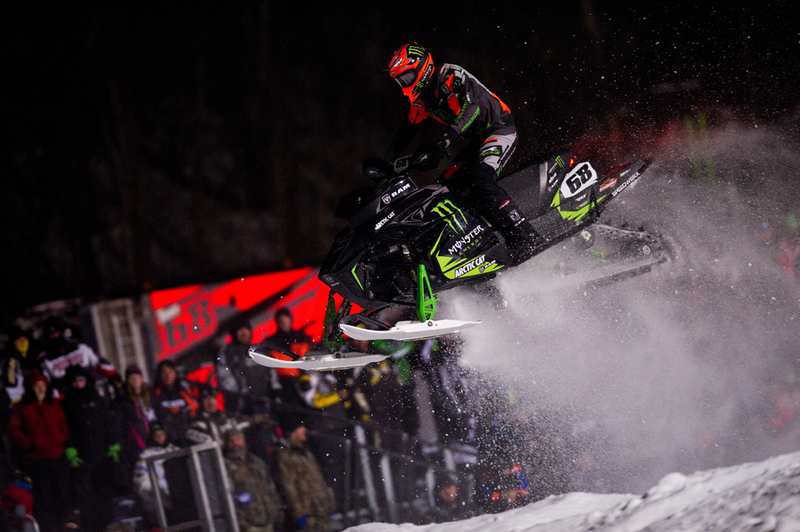 February 27, 2017 – Monster Energy / Arctic Cat / Ram Truck’s Tucker Hibbert had a dominating performance on the second day of the ISOC National Snocross Michigan National in Mt. 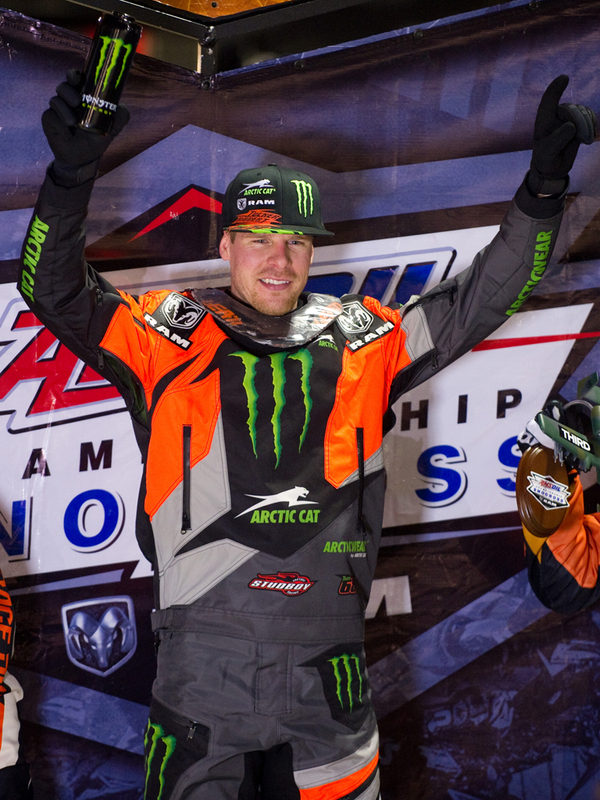 Pleasant, Mich. Nailing the holeshot nearly every time he was on track Saturday night, Hibbert rode with confidence and control to win both his qualifying rounds and the final event at Soaring Eagle Resort & Casino. Friday, the story of the night was the brutal track conditions brought on by unseasonably warm temperatures and intermittent downpours triggered by a thunderstorm that rolled through the area. The event went on but featured condensed racing, with laps cut from qualifying and the final. Hibbert charged hard in all his races but with mid-pack starts, he came up short to finish 2-3 in qualifying and fourth in the final. Feeling good about his rides Friday night, Hibbert entered Saturday focused on winning. He grabbed the Stud Boy Holeshot in both his qualifying rounds and, despite being dealt ninth pick on the start line for the final due to the inverted start procedure, nearly got the holeshot in the final. The opening laps of the 20-lap final, it was a three-way battle for the lead with Hibbert in third. Riding a blistering fast line through the back rhythm section of the track, he made two clean passes for the lead and immediately opened a gap over second place. He rode the remainder of the race unchallenged to take the win. 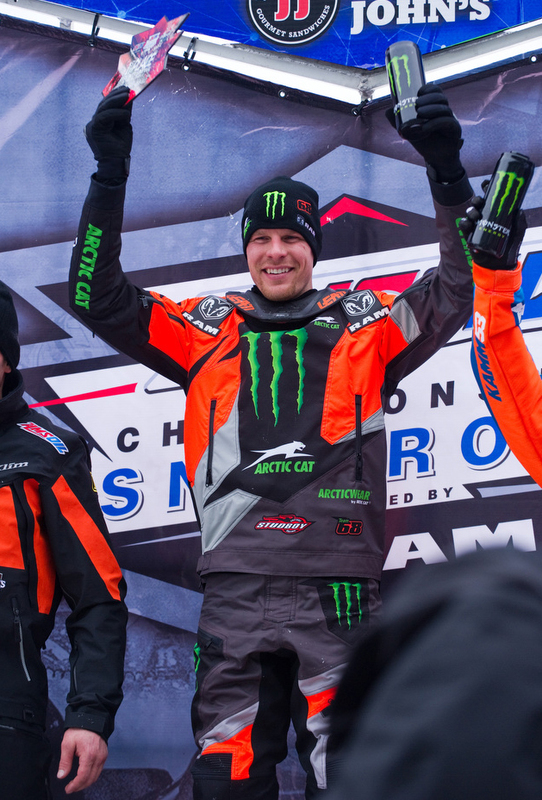 Next up for Hibbert is the inaugural Iowa Snocross National at Dubuque’s Sundown Mountain Resort this weekend. 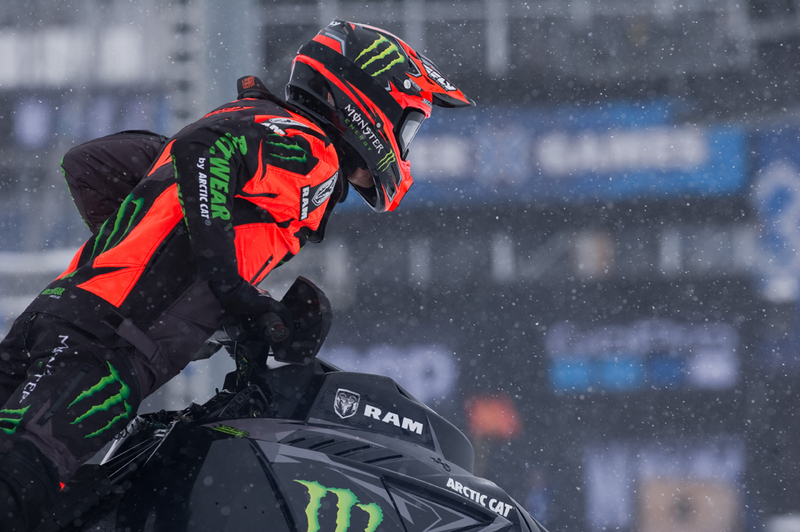 For an inside look into his preparations for the final stretch of the season, visit tucker-hibbert.com and connect to his social media channels. 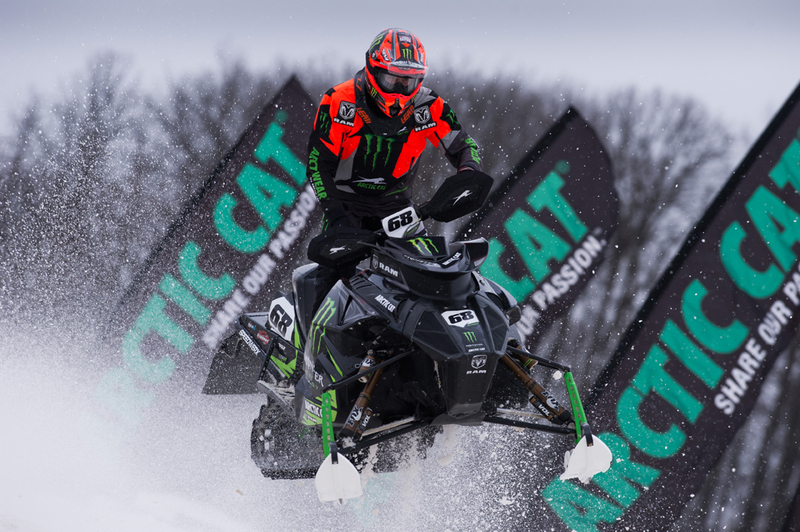 Tucker Hibbert and Arctic Cat have teamed up to give fans the Ultimate Race Experience! 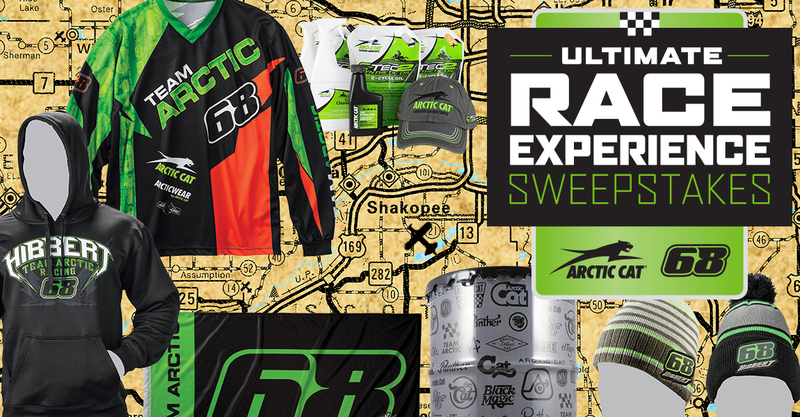 Every snocross race weekend this winter, fans will win autographed Arcticwear gear, race memorabilia, parts and accessories. 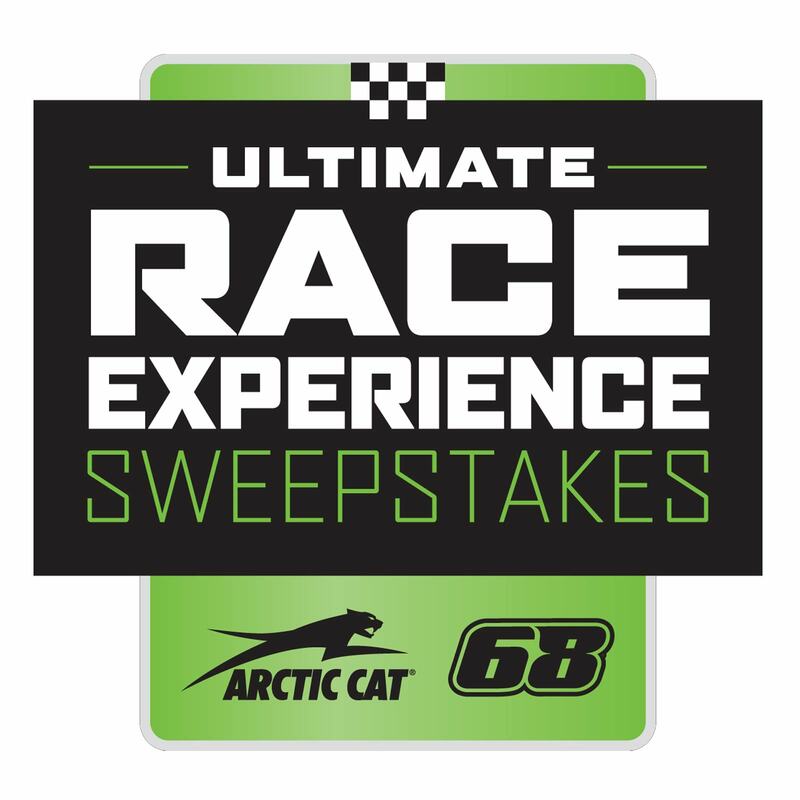 One lucky fan will win the Ultimate Race Experience — a VIP trip for you and a friend to the 2018 ISOC Canterbury Park Snocross National with Team 68! 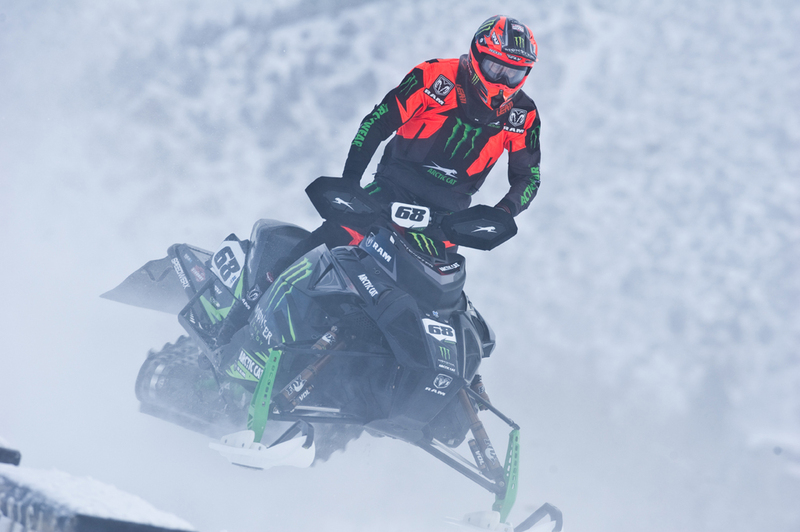 BONUS: With your entry, you’ll receive a code for 25% off any Arcticwear Tucker Hibbert Signature Collection item! 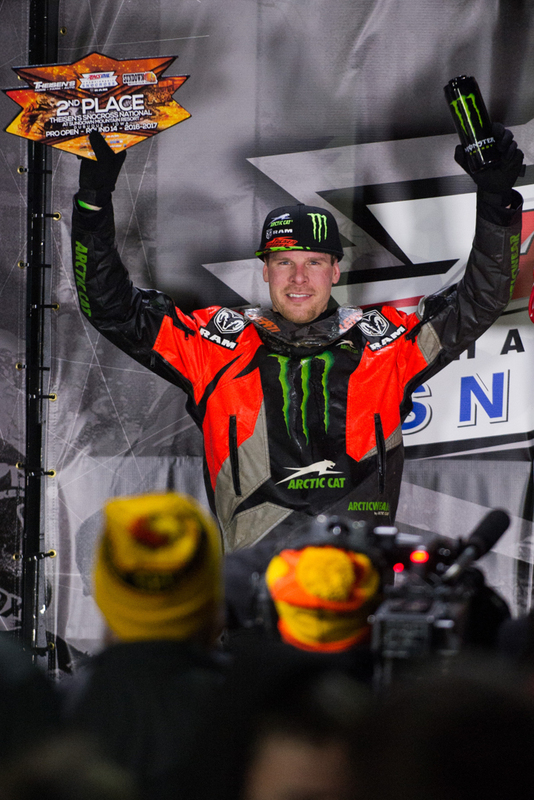 February 6, 2017 – Monster Energy / Arctic Cat / Ram Truck’s Tucker Hibbert recorded his 125th Pro National Snocross career victory Saturday night at round 10 of the ISOC National Snocross tour in Salamanca, N.Y. Hibbert led the milestone race from start to finish in dominating form. 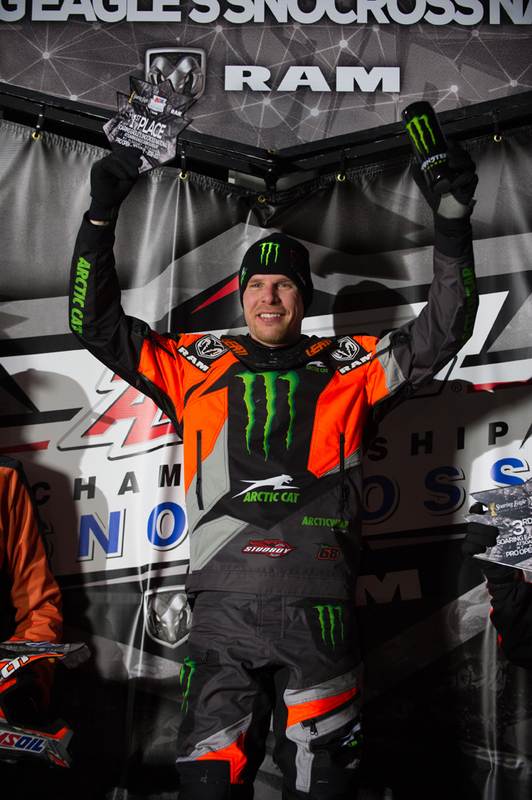 Friday night at the Eastern National, win number 125 eluded Hibbert after he finished a hard-fought second place. Confident in his performance, he entered Saturday determined to get to the top step of the podium. With 4-2 finishes in his qualifying rounds Saturday night, Hibbert had a seventh start line pick for the 15-rider race. Positioned in the middle of the front row, he launched off the line and into the early lead. 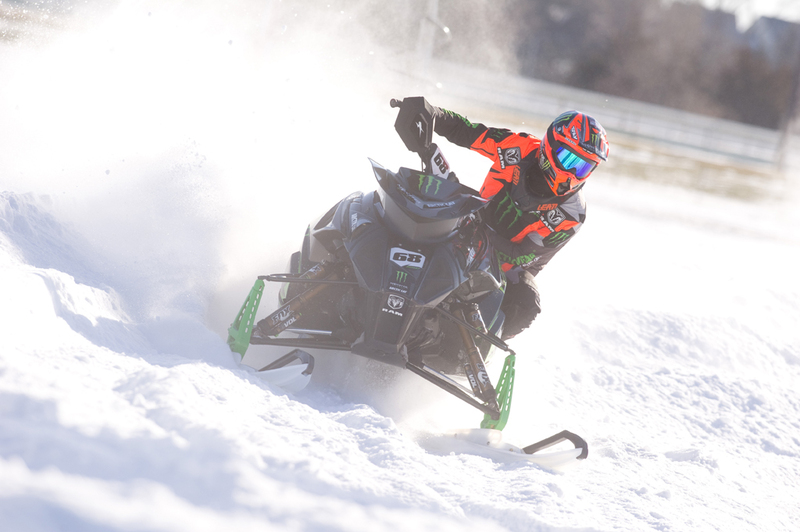 Immediately pulling a gap on the rest of the field, he rode 22 laps smooth and in control while dodging ice holes, snow dust and lapped riders. When the checkers flew, he had lapped up to sixth and held a 10-second lead over second place. 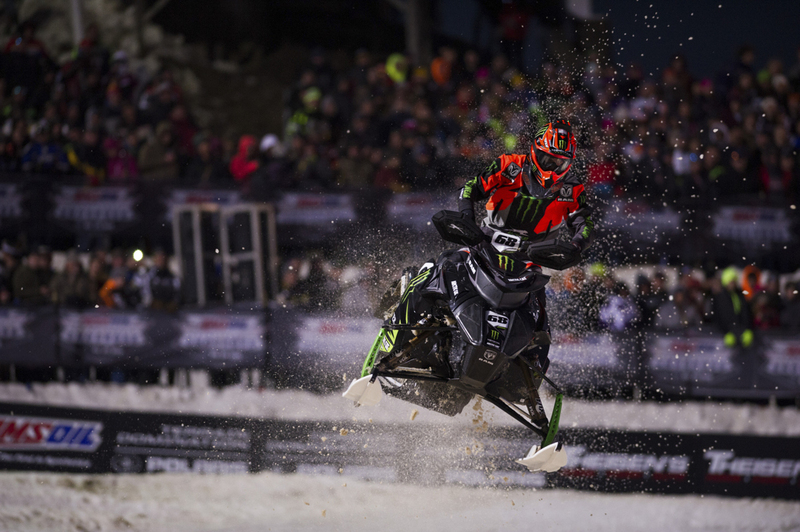 The ISOC National Snocross tour now takes a two-weekend break before hitting the final three events of the season. 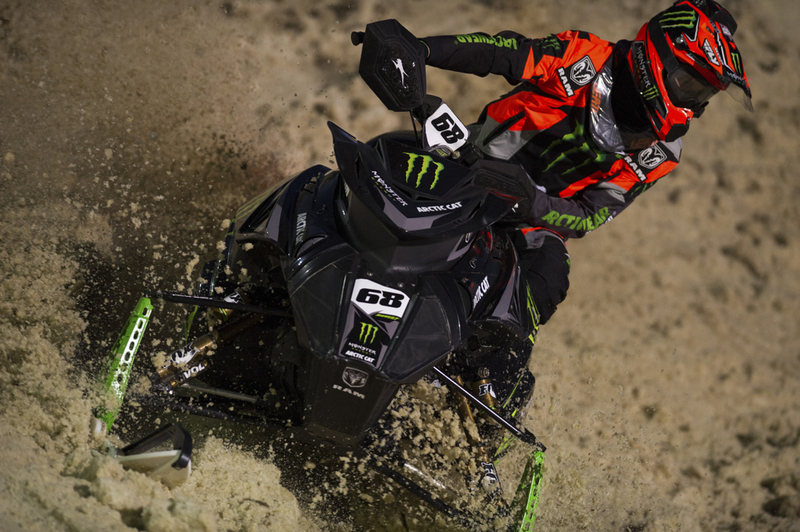 For more information on Hibbert and his race schedule, visit tucker-hibbert.com. 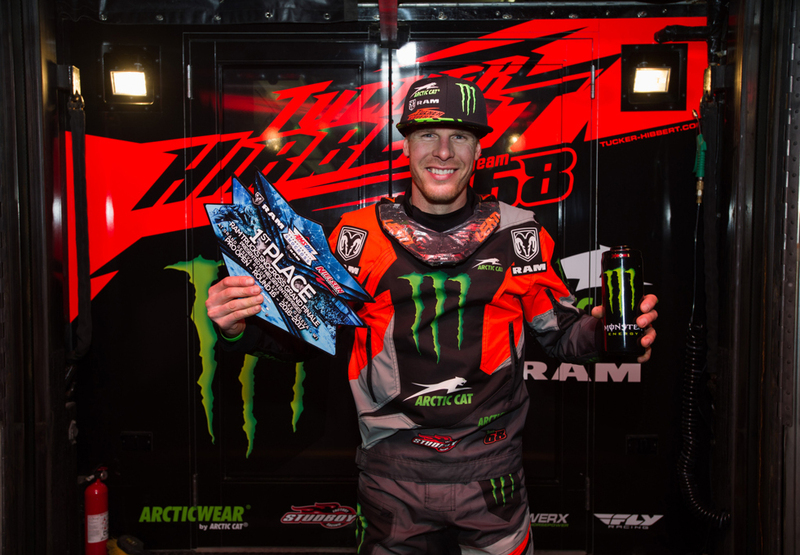 January 27, 2017 – Monster Energy / Arctic Cat / Ram Truck’s Tucker Hibbert finished fourth in the Snocross event at X Games Aspen 2017, breaking a gold medal streak he’s held since 2007. The 14-time medalist was fast in practice and qualifying but came up short in the final. 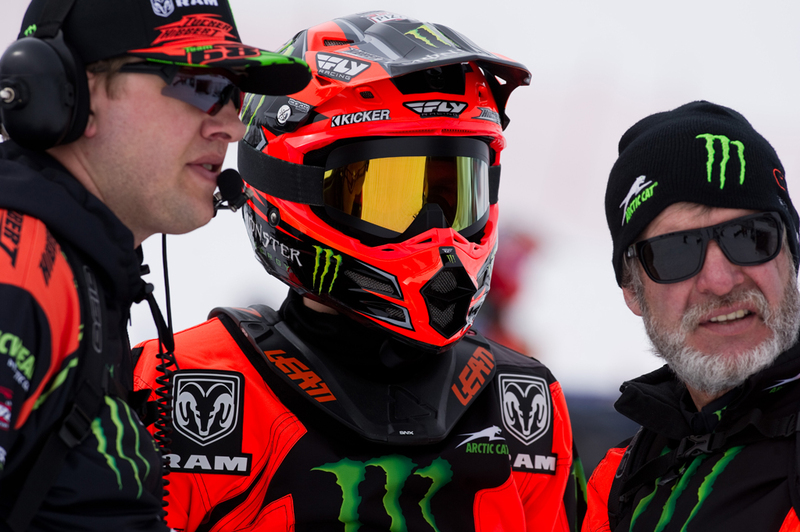 Typically known for its big-air, technical snocross tracks, X Games featured a short track this year with lap times hovering around the 19-second mark. 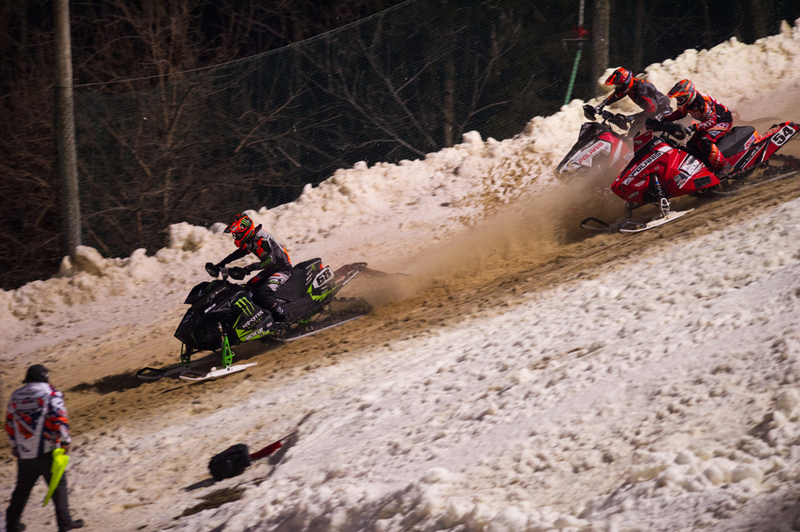 Throughout the race day, the track developed into an icy, one-line course making the holeshot even more critical for a top finish. In Hibbert’s qualifying race, pileups off the start in the tight, right-hand first corner caused officials to restart the race twice. On the third start, Hibbert was third off the line. In lap six of 15, he made the pass for second and held that position to the end of the race. 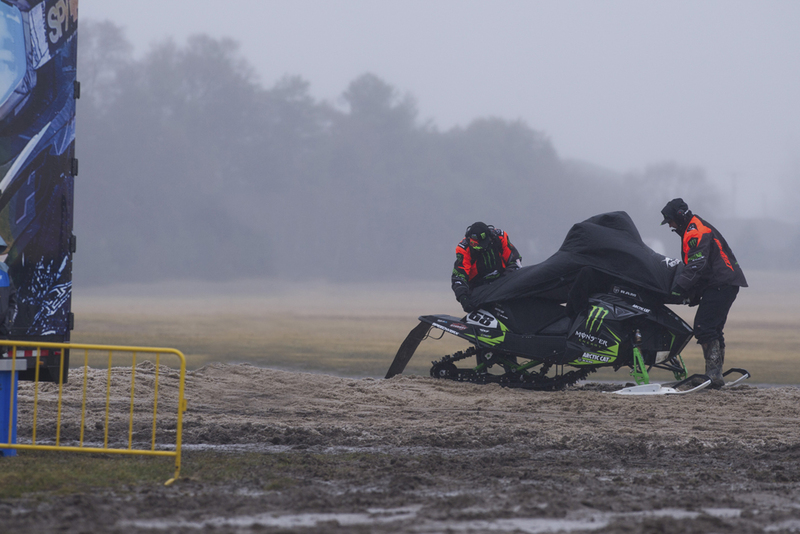 In the eight-rider final, Hibbert got a solid jump off the line and made it through the first corner clean to round lap one in fourth place. He pushed hard for 30 laps, looking for a line but struggled to find an option for a clean pass to finish the race where he started, in fourth. 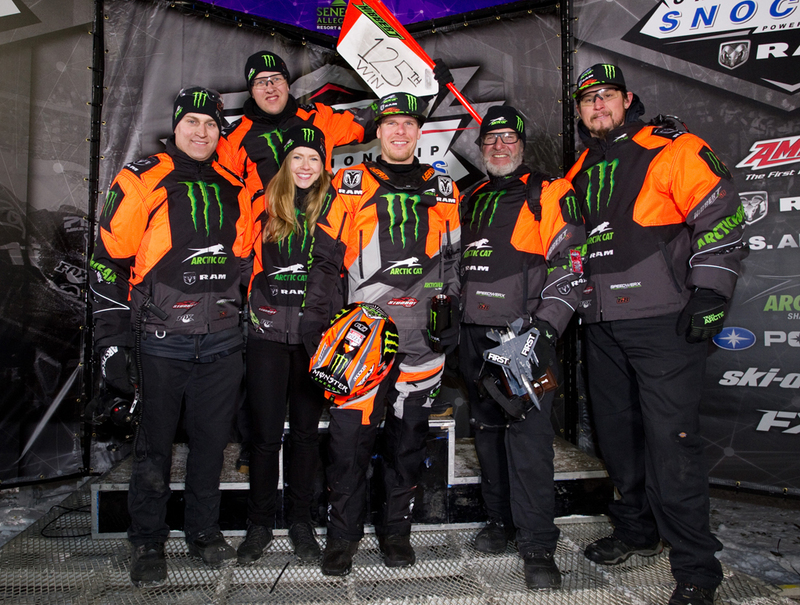 Next up for Hibbert is the fifth stop of the ISOC National Snocross tour in Salamanca, New York. For more information on his schedule, visit tucker-hibbert.com. 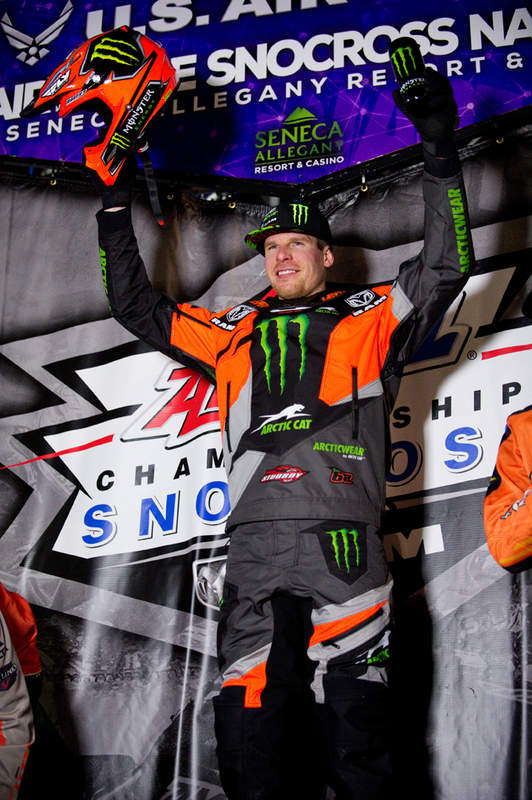 Note: In 2012, Snocross was not contested at X Games. 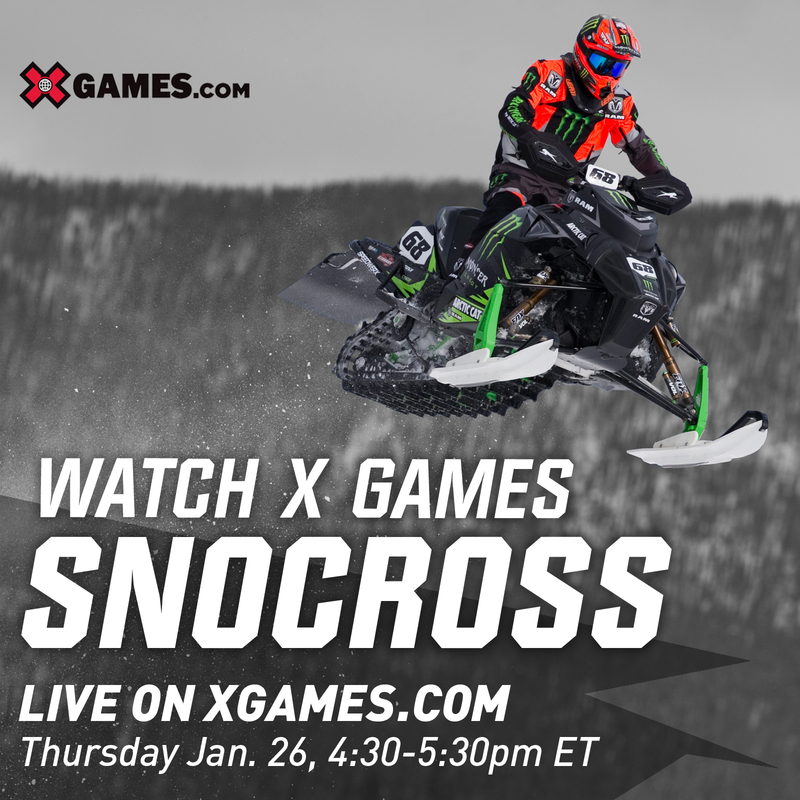 Watch X Games Snocross Live! 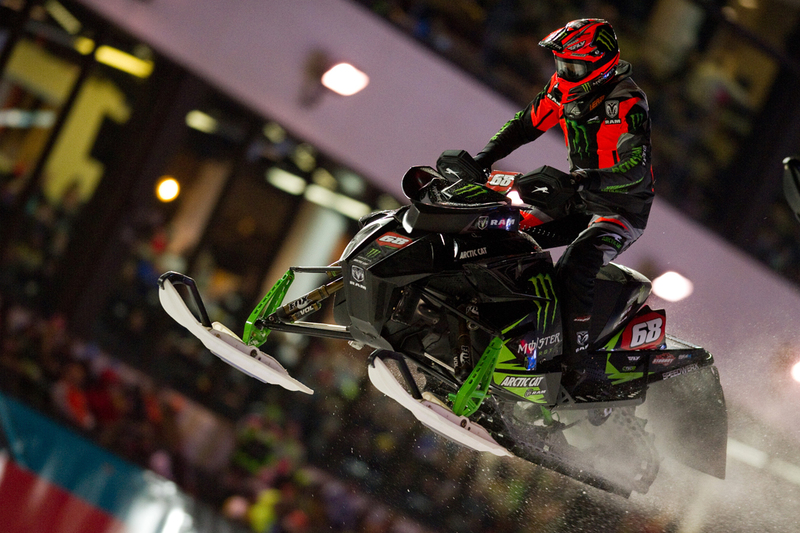 Watch Tucker Hibbert race for his 10th consecutive X Games gold medal Thursday, January 26 4:30-5:30 p.m. ET live on xgames.com. There will be two heats of qualifying with the top four in each heat advancing to the eight-rider final. The event will be delay broadcast on ESPN Sunday, January 28 at 2 p.m. ET. 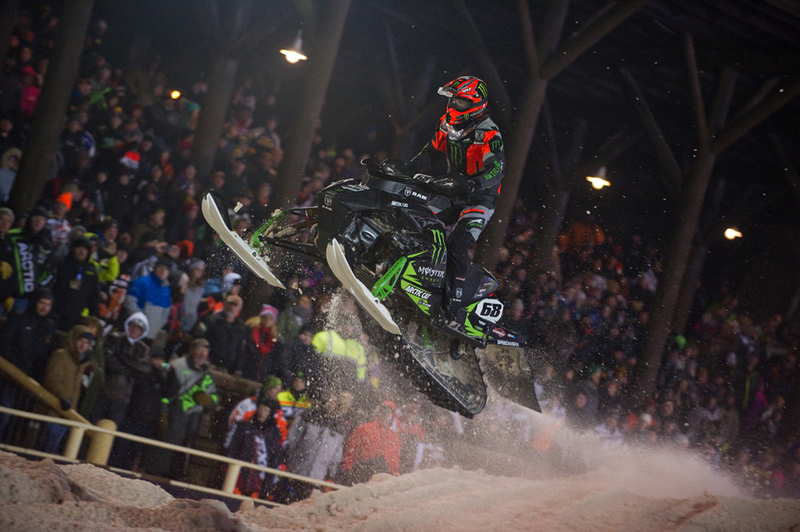 January 23, 2017 – Monster Energy / Arctic Cat / Ram Truck’s Tucker Hibbert took home a fourth place finish and a win at rounds seven and eight of the ISOC National Snocross tour in Deadwood, SD. Despite missing the podium Friday, Hibbert had impressive runs both nights on the tight, rough track – something the sold-out Deadwood crowd has come to expect from the 10-time champion. In Friday’s 14-rider, 24-lap race, Hibbert was buried off the line, rounding lap one in 11th place. Battling heavy roost, he moved around the track, searching for new lines to make clean passes. He charged hard but ran out of time to get to the front, finishing in fourth place. Saturday night’s final was a drastically different race for Hibbert. He took the holeshot, momentarily got shuffled back to fourth place in turn two’s split lane corner but by the time he exited the next corner, he regained control of the race. With a clear track in front of him, he quickly pulled away and by lap 16 of the 24-lap race, he had a jaw-dropping 16-second lead. He rode the remaining laps smart and in control to take his 124th career win. 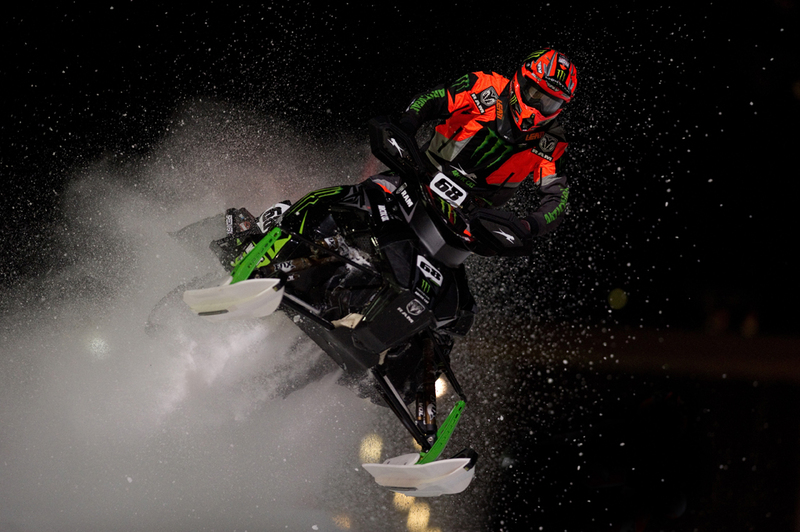 January 9, 2017 – Sunday afternoon, Monster Energy / Arctic Cat / Ram Truck’s Tucker Hibbert won the ISOC National Snocross Canterbury Park Pro Open final in Shakopee, Minn. Below are Hibbert’s results along with his thoughts on the race weekend and upcoming events. Canterbury Park National’s three days of racing action will air on CBS Sports Network January 14, 21 and 28 at 10:00 a.m. EST. 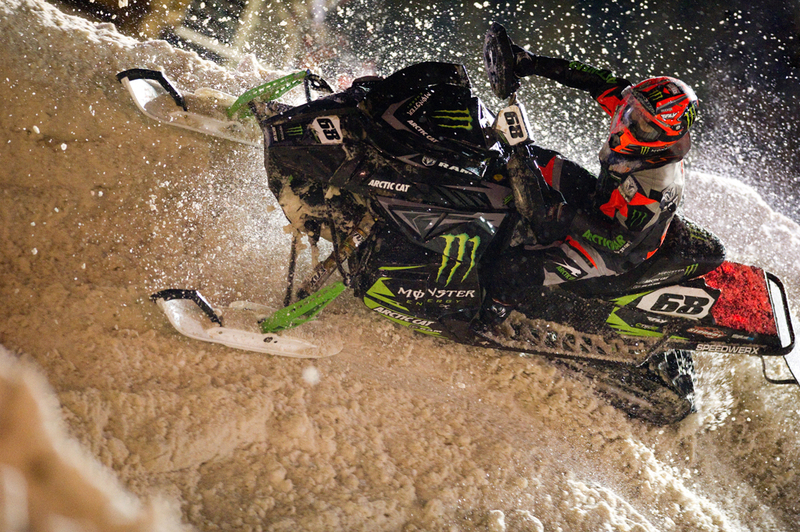 Next up for Hibbert is the fourth stop of ISOC National Snocross tour in Deadwood, SD January 20-21. 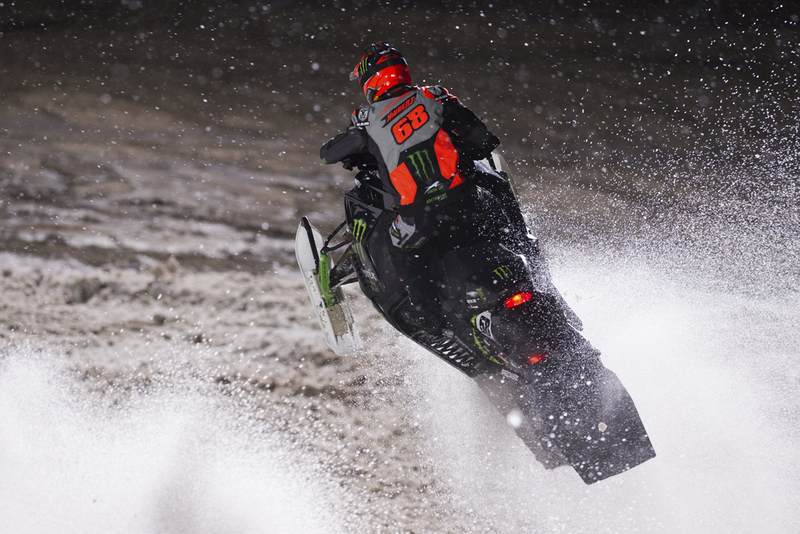 The following Thursday, he’ll compete for his 10th consecutive gold medal at X Games Aspen.